Well... It's bad... but not as bad as you think! 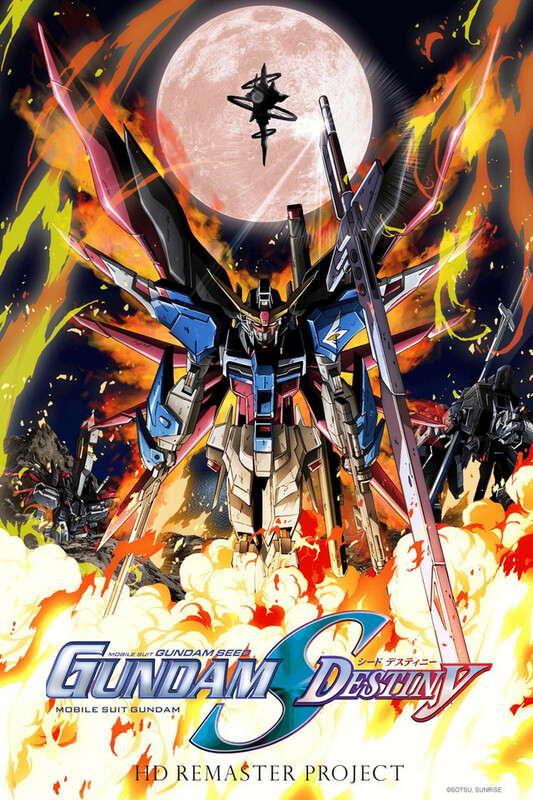 Picking up where Seed left off, Seed Destiny is the sequel series to Seed, this time acting as the "Zeta" to the original "Mobile Suit Gundam" (Zeta being the original sequel series to MS Gundam). I've heard from friends that the show suffered greatly behind the scenes and in the first 20 or so episodes, it really shows. The pacing is all over the place, characters are introduced so they can die or be replaced by other characters (and mobile suits because... Ban Dai), motivations are repeated at nauseousness and to top it all off, the stock footage never ends. Additionally, we are given a completely new cast of characters that tie little if anything with the original cast, a move which would have been okay if the new characters were charismatic and relatable. The biggest sticking point for this show is in the main character for the first 25 or so episodes: Shin. Shin could've worked as the troubled protagonist, and at the start, you can sympathize with him and understand his actions. However, as previously mentioned this show suffered from a major fan backlash and HUGE troubles behind the scenes. As a result, Shin is pushed to the side when the main cast returns and becomes the "Emo baby" that he is infamous for being. Again, I did not have as many problems with Shin as other Gundam fans do, but his Character motivation goes completely awol from the mid-point to near the end of the show (Shin's character at least developed enough to become tolerable in the end and his whole arc came to a good close). However, the show as a whole suffers because of the decision to push Shin to the side. Honestly, when the show does re-introduce the original cast from seed, the series does improve. The writing becomes more focused, character motivations become more clear and (above all) the plot begins to actually move along. I wish I could say that Gundam Seed Destiny is "The worst Gundam show ever", but it is not without merit or praise. For starters, althoughthe mobile suit battles rely FAR TO MUCH on stock footage in some sequences (just count how many times Athrun unsheathes his beam sabres, seriously), some sequences are still great mecha-warfare fun. Furthermore, the new mobile suit designs are an excellent wink to the audience if they are longtime fans of Gundam as many of the mobile suits are renditions of classic designs from the original show. Additionally, the music (while in the same vein of the original Seed) is still fun. Also, the whole climax is filled with hilarious Sci-fi and Gundam tropes mashed together (even the villain gets a rather humorous exit line from the show). In summary, "Destiny" started off okay, had some terrible episodes in the first and second arcs (and some good ones if I'm going to be honest) but did ultimately end on a high note. In my honest opinion while "Destiny" is no where near as good as "Seed" before it, it isn't the absolute train-wreck that people make it out to be. Approach with caution and you could still have some fun with this one. I have watched Gundam Seed plenty of time over and over since it first came out and love the first series. This second series is a continuation of the first. When Destiny came out I wasn't so thrilled watching it the first time. It felt like a lot rehashing was done. Year and years later I decided to watched Gundam Seed and Destiny all the way through and realized how much Destiny was actually quite good. If you watch both all the way through and binge on them, you'll understand a lot more to the overall picture. Now I will say the battle sequences in this weren't great, by the standards of all the other gundam series. A lot of the scenes are loops and the animations are used over and over in the fight scenes. There are a few moments where you'll find yourself saying, "that was epic", but not much. I remember when this first came out, it looked hype but after news spread that the wife of the director took helms creating the story it really was a pretty bad series. The whole seed saga is just a lovers quarrel with bad direct, the only thing good to come out of it were the Gundams and mobile suits. If you like a bad story direction with bad character development and Gundams, than this is the anime for you folks. First I want to say I’m torn between reviewing this objectively or subjectively. It’s a sequel to a reimaging, yet one of many alternative stories of the original. So here’s what I liked. i liked the fact there was action in nearly every episode, and that’s what i watched it for; hot mech on mech action. And it was gorgeous, though I watched the HD remaster. I liked the character progression in Athrun and I liked some of the songs. My issues start with the amount of scenes used over and over and over again. How much screen time does the Impulse Gundam's transformation get? Every single action performed by a mobile suit is animated once and reused, over the span of 50 episodes it’s tiresome. Also all the characters come off as one dimensional, like their point of view of the plot is the only thought in their head. And that’s a problem for a series that seems like 29 episodes of plot and story stretched out to 50. Very little time is allowed for exploring this world or it’s characters. Also the big mysteries and twists come as no surprise. In fact they’re sadly predictable. The whole series is a series of action sequences lazily written together. It’s almost as if the entire point of this series were to sell toys. But ultimately, what I truly didn’t like about this series is there are better versions of this out there. It hurt this series that I’d seen Thunderbolt, 00, Unicorn, G-Reco, IMB, MSG, Zeta, ZZ, The Origin & 08th MS Squad between watching SEED & Destiny. And all of those save ZZ & G-Reco are better than both SEED & Destiny. But is that fair of me? Yes because I watched the HD remaster. I liked it but there are at least eight better versions of the same thing out there. You will HATE shin and that's okay it does get better! it gets much better and kira and co become the main again. Also the ending is amazing!! Spits on and insults the previous SEED series. The infamously bad Gundam SEED Destiny. A series that even Gundam SEED fans I know despise. All of my friends who liked SEED hated SEED Destiny. Destiny literally copies the exact same plot points and story devices as the previous series from middle to end. Also recycled animations are used far more frequently than the previous series. The writers and director basically threw Athrun's character development out the window from the previous SEED series and he makes the exact same mistakes and has to relearn the exact same lessons again. The protagonist Shinn is the most irritating character ever. He's arrogant to the point of smugness, rude to the point where it's annoying, angsty to the point where he always thinks he's the victim, and he's pissed off all the [email protected]#king time. Throughout the story, he only gets worse. He goes through almost no character development and eventually becomes a delusional, hypocritical, almost insane antagonist. Originally, Shinn was supposed to become a more developed, humble, and respectable protagonist throughout the story in the original script, but that was thrown out to make Kira a main protagonist again. Kira Yamato makes a comeback, but he wasn't supposed to. Originally he was supposed to be permanently retired and doesn't fight, but the director's wife forced the director to shoehorn Kira back into the story. All he does is shoot the enemy mechs arms and legs off while screaming "STOP FIGHTING! as tries to retain the Batman code of not killing. was reduced into a damsel in distress and then written out in the story due to her seiyu, Naomi Shindo, quitting in the middle of production. Rumors have it that the director's wife accused Shindo of sleeping with the director. These accusations were dropped with the defense of the other VAs, but this incident caused her to quit and swearing to never work with the director ever again. In the end of this series, Cagalli breaks up with Athrun due to the director's wife's hatred of these two characters. Why? Because F.U AthrunXCagalli fans. That's why. When watching this, I felt like I was rewatching the entirety of Gundam SEED all over again in a bad way. This series is a mess and a complete insult to those who even had the smallest liking towards the previous series. I was okay with the SEED series, until SEED Destiny came along and ruined everything. If you loved Gundam SEED, don't watch. There's a sequel supposed to be coming, but due to complications, it's most likely never coming out. If Code Geass is master piece, then Gundam Seed Destiny would have to be Sunrise's magnum opus. Where else would you see the main character abruptly switch not even halfway through the series. If you love stock footage this show goes above and beyond your wildest dreams. The director bullying the voice actors by making their characters weaker because the writer doesn't like them. T.M Revolution returns with three monumental tracks that must be heard. For anyone interested getting into the Gundam series, the Gundam Seed series is the cream of the crop of Gundam. Also watch Cross Ange. My review for Gundam Seed overall. I am possibly one of the biggest Gundam fans, i own almost everything on R1 DVD and have paid a lot of money to support the series but.... Seed... oh dear god... Crying, crying, crying, every 6 minutes someone is crying. This is so melodramatic it makes me sick. I watched all of it AND Seed Destiny when they were new. They nailed down the rivalry aspect of the show, the Gundam's were ultra powerful which i love, epic space battles, great story, but so much crying, it never stops. I wish i could give this a higher score. I understand Gundam franchise is wide and expansive, it fits many different styles from dark to light to sad but this is just forcefully overly dramatic. If you like the darker stuff check out Gundam00 for a great Gundam series.